Research can be defined as scientifically and methodically delving into the unknown in order to provide information for solving problems. The heart of this definition is the concept of problem solving. Both applied and pure (also known as basic) research attempt to solve problems. In applied research, the researcher attempts to solve a known problem and find answers to specific questions. In other words, the emphasis of applied research is on practical problem solving. For instance, when a paper recycling company wants to determine whether or not their recycled papers meet the required specification as to the thickness of the paper across the roll, they might design a systematic procedure for answering this specific question. The research in such a situation represents applied research. Another example of applied research might be that of prediction. As an example, consider a trucking company that is interested in predicting the tonnage of material shipped in the next quarter. The practical problem is predicting the tonnage and determining which variables are good predictors of tonnage for the next quarter. On the other hand, pure, or basic, research does not necessarily try to answer specific questions or solve specific problems. Pure or basic research is done in order to expand knowledge and probe into the unknown. For example, when a researcher is interested in determining how employee demographics and tenure on the job relate to preference for flexible work schedules may represent pure research. Both pure and applied research deals with problem definition and problem solving. Most basic research is conducted by professors in academic institutions (i.e. colleges and universities), by the government, or by consulting firms. Few business organizations will engage in pure research related to business problems. However, understanding the process and methods used for both applied and basic research are important to interpreting research results. Any research involves several chronological steps, but that does not mean each step must be completed before the next step is undertaken. Furthermore, the process of research is dynamic and the process may change as the research progresses. 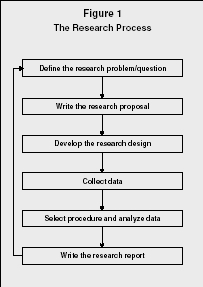 The steps involved in most research endeavors are shown in Figure 1. Managers' needs for information are the primary source of problem definition and the research question. Managers need information to make educated decisions arising from unanticipated as well as planned changes. As such, managers must select between different alternatives and thus require information about the organization and its environment. The question to be answered or the problem to be solved must first be clearly defined. Questions to be answered could be very specific or extremely broad. The more specific the questions, the easier it will be to answer the research questions. There might be hypotheses that could be tested scientifically. Once the questions to be answered are clearly defined then the value of the research must be assessed. Clearly, if the costs of performing the research project exceed the value that the research will provide, then the project should not be continued. Research endeavors require a proposal that explains the problem to be address and the procedure by which the questions will be answered. The researcher's proposal tells the managers what they should expect from the research. It is a contract between the managers and the researcher. For instance, if a company wants to know the degree to which its new incentive program is effective in improving employee performance, then the consultant or employee conducting the research will create a proposal that indicates to that company how the question will be addressed and what specific information the company will have at the end of the research process. The proposal may indicate, for example, that the research will indicate the level of satisfaction of employees with the new incentive plan, the increased firm performance with the plan, and the individual increases in performance (as measured by managers) with the incentive plan. 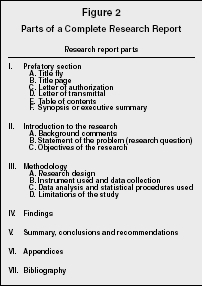 The purpose of the research proposal is to effectively guide the researchers in their development of the research design and data collection to answer the specific research questions. There are two broad categories of experimental designs: field and laboratory. In both field experiments and laboratory experiments, the researcher controls and may alter and introduce some variables in order to determine the effect of a given variable. Field experiments are done in a natural setting, whereas laboratory experiments are undertaken in a simulated setting. Studies on the effectiveness of different configurations of teams and their level of effectiveness can be undertaken in both field and office settings. In an office setting, a researcher might organize workplace teams, using different criteria to establish each, then measure the success of their group interactions and their productivity on real work tasks. This would be a natural setting, except for the way in which teams were organized. Team composition could also be studied in a laboratory in which the researchers had complete control over more variables. To study team effectiveness in a laboratory setting, individuals would be placed in teams using different criteria, then asked to perform a series of tasks specially designed to measure team interactions and performance. This laboratory setting would allow the researcher more control, because the types of individuals involved could be chosen, rather than using only the employees available in a field setting; by designing tasks specific to the study, rather than using existing work tasks; and by having more ability to watch and measure team performance without hindering organizational performance. PRIMARY DATA AND SECONDARY DATA. Data can be primary or secondary, and whether one or both are used, and which is used, depends largely on the research question and the availability of these data sources. Secondary data refer to data gathered by others or from other studies. Secondary data is generally less costly and less time consuming than gathering primary data, typically is accumulated before primary data is gathered, and may even help determine the course by which primary data is pursued. An example of secondary data is if a company uses data from the U.S. Census or data collected for another organizational activity (e.g., performance information for individuals from the company's annual performance appraisal). While secondary data can be used for background information about specific research, it may also answer some specific research questions. However, because secondary data was collected for another purpose, it may not adequately address the new research question. In today's world of rapidly growing information technologies, secondary data are available from numerous sources. A researcher should explore the existing data before starting the research process, since there are datasets for many different types of information currently available. There are abundant data available in literature, company records, government publications, trade associations, and through the Internet. Survey design is of major importance, because is a survey is poorly designed, it will not provide the researchers with the data that addresses the research question. Survey questions, called items, must be properly chosen to in order to elicit appropriate respondent answers. The steps involved include determining the information that will be sought, the type of questionnaire, the method of administration, the content of individual questions, the form of response to each question, the wording of each question, the sequence of questions, the physical characteristics of the questionnaire, and, finally, pre-testing the questionnaire. One concern when designing a survey is how to word the items. One of the most popular ways to measure attitudes on a survey is by using the Likert scale. This method presents a series of statements to respondents for which they are asked to indicate the degree to which they agree with the statements. An example of a statement might be "The sales people are helpful." Respondents are asked to indicate the degree to which they agree with the statements by checking either SA (strongly agree), A (agree), N (neither agree nor disagree), D (disagree), or SD (strongly disagree). Respondents' answers would then be scored where SA = 5, A = 4, N = 3, D = 2, and SD = 1. A total score would be computed by average or summing scores on related items. When administering a questionnaire there are two options as to who should complete the survey. Option one is to give the questionnaire to everyone in the targeted population. This is called a census. However, a census is usually not practical or cost effective. For instance, you may not be able to survey every one of your customers from last year to determine levels of customer satisfaction with your products. Consequently, in order to save time and money, only a sample or subset of the target population receives the questionnaire. The chief advantage of a probability sample over a nonprobability sample is the ability to assess the reliability and the amount of sampling error in the results. For example, if the goal were to estimate the annual household income for a given county, probability sampling would allow an accuracy assessment of the estimate. This could not be accomplished with a nonprobability sample. After the survey has been designed and its reliability and validity assessed, the company must decide the administration method that it will use. Each administration method has its own advantages and disadvantages in terms of cost, information control, sampling control, and administrative control. Information control refers to the possible variation in responses to questions. Sampling control is the ability to select cooperative respondents. Administrative control refers to factors affecting the efficiency of the survey, including timing, quality control, and standardization. Once the data is edited it is ready for coding, which is determining how survey responses will be transformed into numerical data. The first step in coding is the development of a codebook. The codebook formalizes the coding process by listing answers and their accompanying codes. After the data is coded and entered into a data spreadsheet, statistical analyses can be performed to create useful information for the researchers. If there are hypotheses to be tested, the researcher is in a position to use the gathered data to test the hypotheses. Data analysis could be as simple as reporting descriptive statistics such as averages, measures of variability, and percentages, or if needed, advance statistical techniques could be applied. In this part of the report, first a title fly needs to be prepared. The title fly only includes the title of the report. The title should be carefully worded so it tells the reader exactly what the report is about. Following the title fly is the title page. The title page should include the title of the report, the name and the title of the recipient of the report, and the name and the title of the individual who prepared the report and the date. The letter that authorized the undertaking of the research project, followed by a letter of transmittal indicating the completion of the research report are the next items included in the report. Include a table of contents followed by an executive summary. The executive summary, summarizing the report's major findings, should be brief and to the point. This summary should briefly explain the conclusions. This section will provide a detailed explanation of research design and will provide answers to many questions. What type of design was used? What instruments were used for the collection of data? Were there any subjects involved in the study? What did the subjects do? How was the sample selected? What kind of statistical or non-statistical techniques were used for data analysis? Finally, in this section of the report the limitations encountered in the study should be presented. This section is probably one of the most important parts of the research report. Provided in this section would be the results of the data analyses and explanation of all the findings. At this point, all the raw data have been analyzed and converted to meaningful information for management's use. This is the section where the original research question is answered. A concise yet precise summary of major findings will be included in this section, followed by any recommendations that the researcher considers important and meaningful. Statistical tests, large tables of information, copies of measurement instruments, and supporting documents should be included in the appendices. Finally, the report should end by providing a bibliography of all sources of information. Babbie, Earl R. The Practice of Social Research. 10th ed. Belmont, CA: Thomson/Wadswoth, 2004.
Cooper, Donald R., and Pamela S. Schindler. Business Research Methods. 8th ed. New York: McGraw-Hill, 2003. Hoover, Kenneth R., and Todd Donovan. The Elements of Social Scientific Thinking. 8th ed. Belmont, CA: Thomson/Wadswoth, 2004. Salkind, Neil J. Exploring Research. 6th ed. Upper Saddle River, NJ: Prentice Hall, 2006. I am doing an aplied reserch for my MBA. This article was very usefull to me. This reminds me of how psychology experiments are carried out. Very interesting reading.